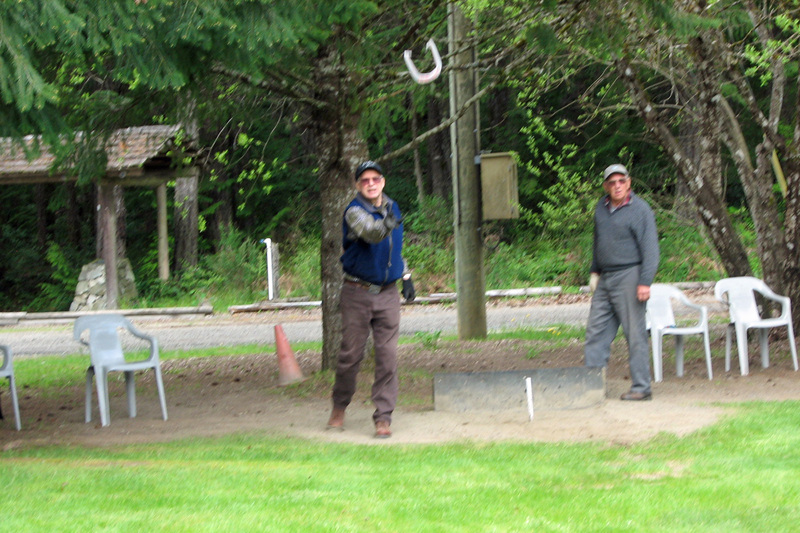 The first Sunday of each month, approximately 10:30 a.m. start, is horseshoe day at the range. The league is for mixed teams with various skill levels. A handicap system ensures everyone has a chance to compete equally. Everyone is welcome to join the league. When the weather is too bad for horseshoes some of the crowd can be found playing cards in the gazebo, but beware this hardy bunch has been known to throw horseshoes by flashlight in the dark and in snow storms! 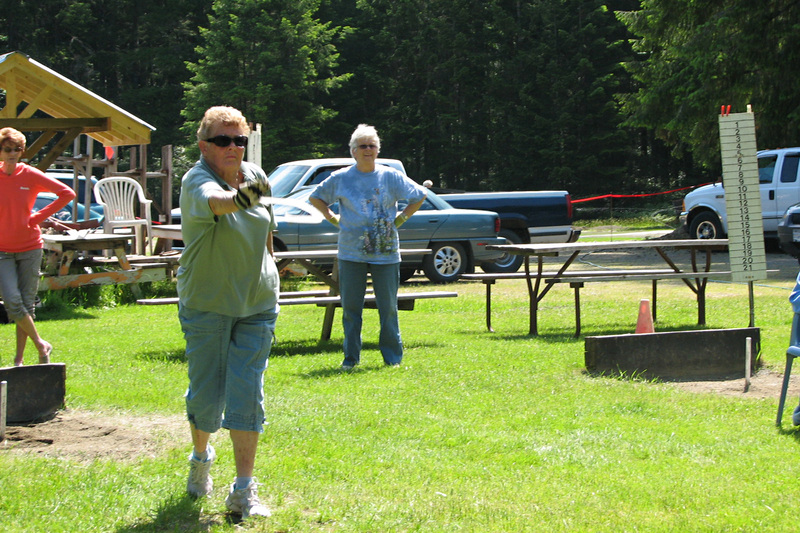 June 14th, the annual Cowichan Fish and Game Association Browns’ Day was celebrated at the range with our traditional Pig Roast. Members of the Horseshoe Chapter convened at the event. Thanks to all who helped by bringing desserts and raffle prizes and as well to all who attended. As this is a club functions, we would like to encourage some younger members to help with this event. About 84 members, friends and their children enjoyed the dinner and raffle night. Quite a few members and non-members camped on the grounds for the occasion. A pancake breakfast was served on Sunday morning. As well as the campers, many guests from the night before returned for breakfast. With funds raised, we have been able to purchase a new fridge for the Founders Hall ( Gazebo ) and will additionally purchase landscaping supplies including sprinklers. Also, plans are to purchase more white plastic tables for the Gazebo or wherever needed. ( It wears out the tables and the “guys” moving them between the Clubhouse and the Gazebo. 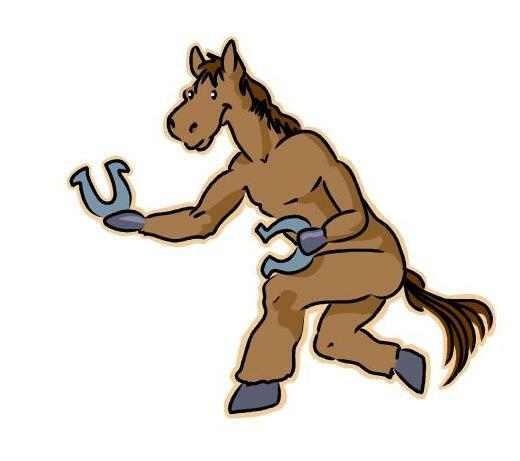 Brown Day was started in 1988 with a Pig Roast at Bell and Agnes Jackson’s to honour George Brown…a retired Alberta farmer and sportsman living in Cowichan Lodge, who generously donated $10,000.00 to the club in 1988. This donation enabled us to install hydro to the club and thus encourage people to apply to be a caretaker. Tom Duncan was chosen at the time. In 1977 the event was expanded to Browns’ Day to also honour Roland Brown for all the work he had done and continued to do building and maintaining the Cowichan River Footpath, both before and after it was taken over by B.C. Parks and renamed the Cowichan River Trail. Cairns to both Browns are under the roof on the left as you pass on the way to the clubhouse and ranges. Our 2014 tournament was held on the rainy weekend of May 2nd. After the many games were played, Mo Orrick presented the Hal Orrick Memorial Trophy to tournament winners Vera Glover and Jim Anderson. Norm Sharp and Shirley Currie were ended up in 2nd place. For our 2013 -2014 League games, the Dennis and Cindy Popplestone Trophy was presented to the league winners Norm Sharp and Shirley Currie. Mo Orrick and Patrick Hill took 2nd place after a tie breaking game. All winners received gift certificates. Thanks to all members for their help throughout the year and at the wind-up tournament. We are changing back to our original play schedule….a set of 3 games. 2 out of 3 games for 1 point and play each team 2 sets. Our 2015 Tournament will be held on the May 1st weekend. It is the responsibility of each team to finish their games and turn in the completed play-sheet to us by April 25th so winners, handicaps etc. can be determined. Thanks! Patrick Hill volunteered to help us on the “steering” committee. Brave man, Patrick! But, we appreciate it.